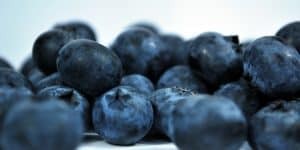 Fast, healthy, make ahead breakfast? Yes, please! This breakfast meal prep is going to make life sooo much easier. Mornings are a little crazy around here. As I’m sure it is for many families heading out the door for school or daycare drop off or work. Or all of the above. 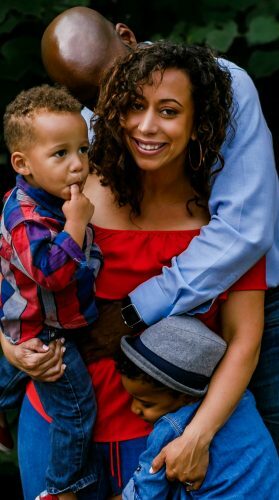 Of course my 3 year old Miles has no concept of time or urgency. He stops getting dressed to look at his shadow on the wall and wave at it. Yes that happens, usually pretty cute and funny- except for when he should be getting dressed. Lol. Or decides right before we leave the house that he needs to bring a lego man with him in the car. So if we are running late, making him go faster is pretty much impossible and drives me crazy more than it does anything to his speed. 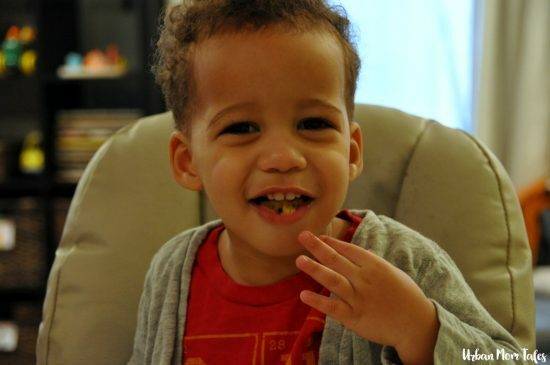 We’ll usually cut corners with breakfast and do cheerios with banana. But that gets old and doesn’t have all the nutrients we’d get if we cooked something. Our two favorites around here are eggs and oatmeal. They are filling and healthy- perfect breakfast options! Even if it takes 15-20 minutes to make- those minutes are precious on a busy morning. 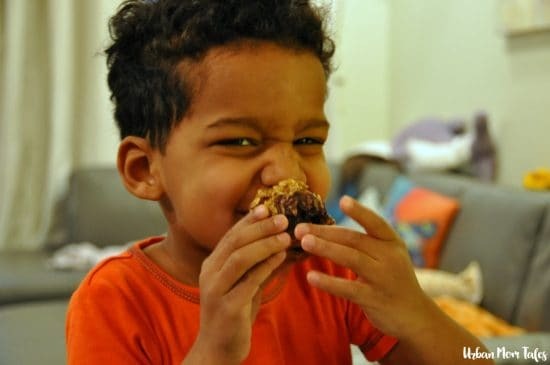 Today is Monday and I gave one of my sons a bacon and bell pepper egg muffin and the other a blueberry banana oatmeal muffin. This took me 2 minutes! Mind blown. Why didn’t I do this earlier?! And the meal prep was so easy! 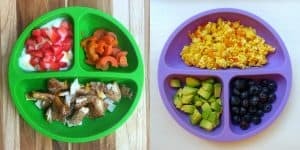 If you’ve read any of my baby food and finger food meal prep– you know this is my favorite way to plan. Sorry, I’m really excited over here. Let’s get to cooking. 60 muffins (!) Took me 2-3 hours total (while also taking pictures). Perfect nap time project, or if you have older kids- they can help. Should last for a month if you are using for weekday breakfasts- all depends on the amount of people in your family. We all love these- and my husband eats at least two at a time so we’ll see how long they last for us!. You can do less if you want, I’ll put in notes for modifications. But it was pretty simple to do a lot because you already have all the ingredients and tools out. Subscribe below for a printable grocery list. I’ll also break it down for each dish in the steps. Use this shopping list to make your meal planning even easier! Subscribe (free!) to my newsletter with 8000+ moms and get tips for mom life, projects, and meal preps PLUS get instant access to my resource library with ALL of my other free files and printables (including this shopping list)! Once subscribed, I will send you a newsletter with all the details. Success! Now check your email for details! Get out everything you will need- kitchen tools and all ingredients. Group together the ingredients for the oatmeal muffins and then the egg muffins. Preheat your oven to 375. Everything will cook at this temperature. 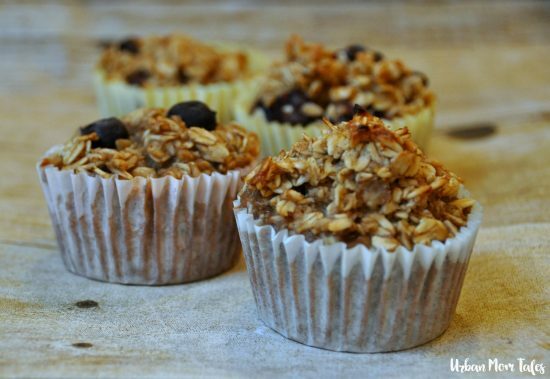 The oatmeal muffins were inspired by this recipe, she has other amazing flavors you can try! I did change a few things- per usual. My meal plan uses my changes: added an egg and used a little less oatmeal, milk and sugar. 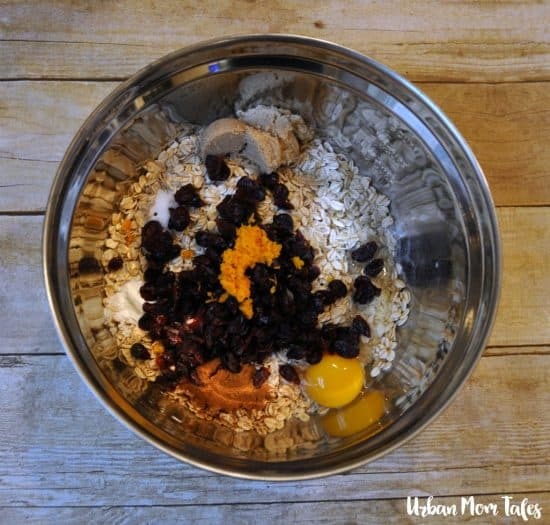 This is the base for each oatmeal muffin pan. 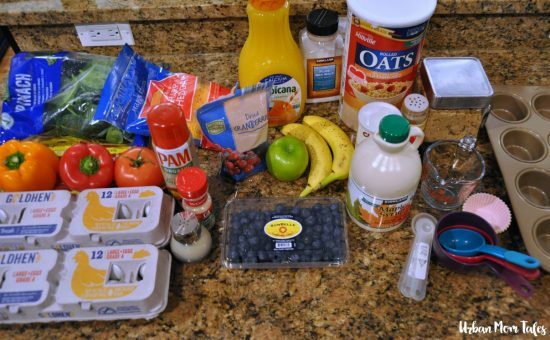 In your grocery list, these ingredients were multiplied by 3. So if you only want to do two for example, you can take this list and multiply by 2. 1/8 cup or 2 tablespoons of brown sugar (or coconut sugar, stevia etc.) *These are not very sweet at all, you can double this sugar amount like the original recipe. They still shouldn’t be too sweet. 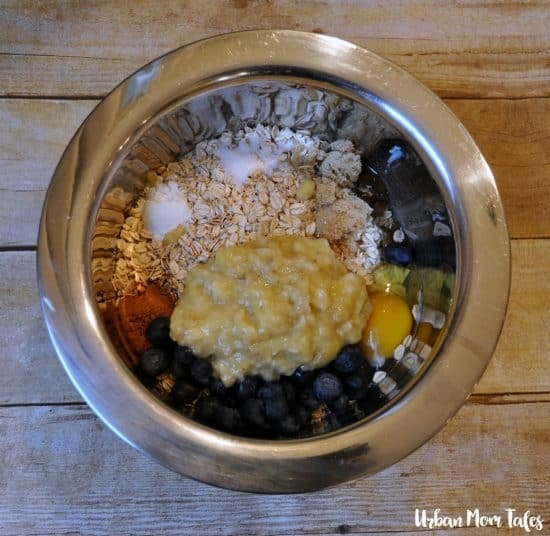 Add these toppings to your bowls and then mix all together. 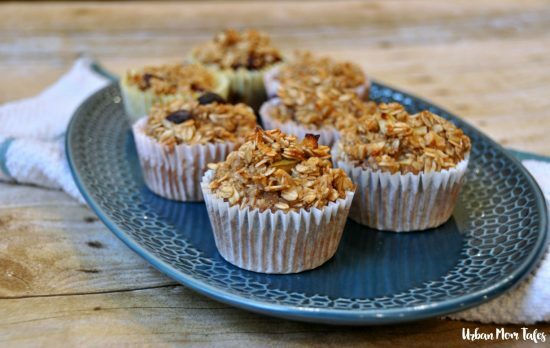 Put a cupcake liner in each of your muffin cups or spray with cooking spray. Use a 1/2 measuring cup to fill. Cook for 25-30 minutes. I put two muffins pans right next to each other on the top rack and they cooked perfectly. Check to see if the tops are getting golden crisp- that is when they are done. *I have 3 muffins pans so I poured the 3rd kind in the pan and put it to the side until the first two were done. 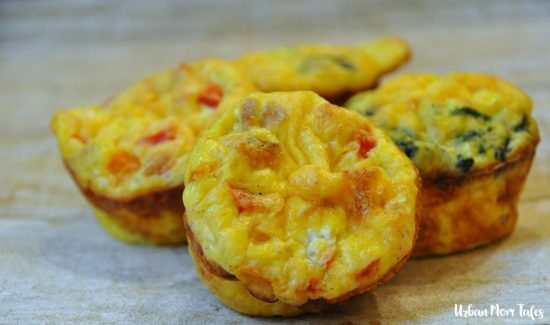 While those are cooking, start prepping your egg muffins. I washed two of the bowls from the oatmeal muffins to use again. I’ve made egg muffins so much that I use my own recipe. 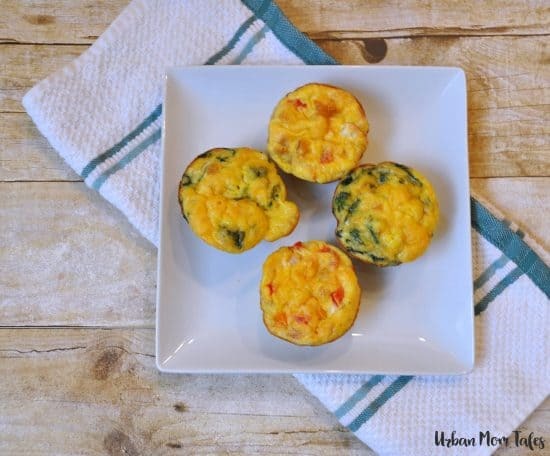 It’s the next 3-4 steps if you just want to cook egg muffins. 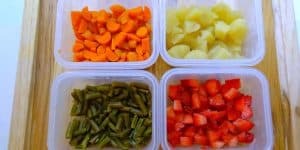 Add the following vegetable mix ins to each bowl. You can modify your vegetables with whatever you like- onions, mushrooms, broccoli, etc. 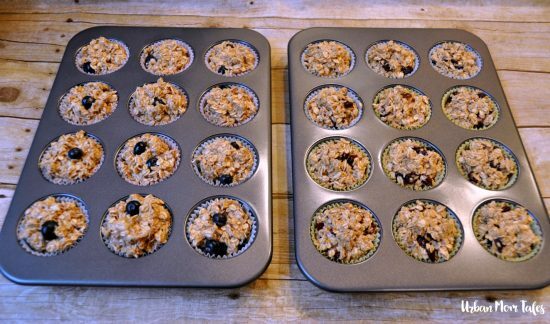 In the middle of my egg muffin prep, my first round of two dozen oatmeal muffins were done so I put the third in. Then I had to wait a little bit to put in the egg muffins. 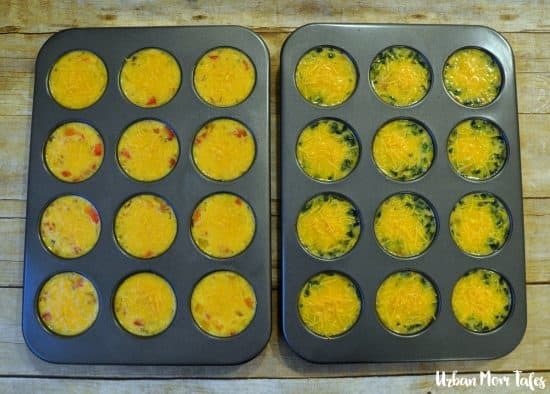 Wash the first two muffin pans- if you used liners, they won’t be that bad. Spray your pans with cooking spray (or use liners). With a 1/2 cup scoop- fill up the pans. *Top each cup with a little cheese. You won’t regret it! Or if you rather delay that as much as possible….your first batch should be done and cooled for at least 10 minutes. Begin storing them for the freezer. More on that in step 9. Cook egg muffins at the same time on top shelf. 20-25 minutes. After each one is done cooling (10+ minutes), start putting them away. I wrap each one in plastic wrap and then put in a gallon freezer bag. 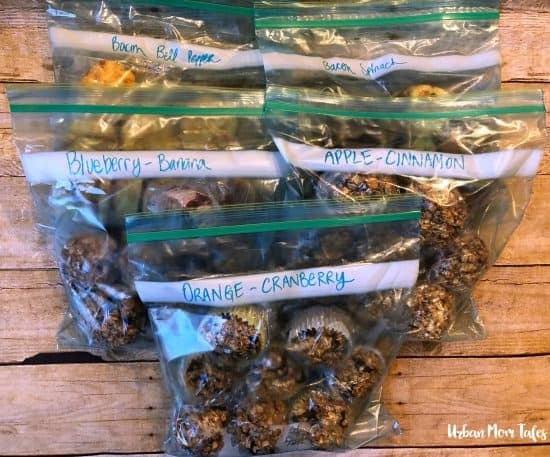 Label each bag and put them in the freezer! You can also store some in the fridge to eat that week. They last for a week in the fridge and up to 3 months in the freezer. From frozen, warm up for 2 minutes in the microwave. Bonus Tip: For my two sons, I can cut an egg muffin and an oatmeal muffin in half. Then give each of them half of each. This way they have protein, veggies, fruit and fiber all in one! And that’s it! You might feel a little tired now but wait for that first school/daycare/work morning. Especially the Mondays- it’s amazing!